It's been a long time now since I read 'The Iliad', so it's finally time to write a review. Initially, I wanted to let the story sink in to see how it aged in my mind. Eventually, I found that I was just getting a little bored of doing reviews and it didn't seem to fit into my schedule. But I find that the time taken to write these reviews is worth it in the end, because I can tell where my head space was looking back through the course of my life. If I re-read any of the classics that I love, will I still feel the same way about them years later? I have heard that many who loved 'The Catcher in the Rye' when they were adolescents, don't feel the same connection to Holden as they did when they first read the novel. (Parenthetically, I've read it three times now, and I feel just as strongly about it now that I did then). But I digress. Most books I read, I have very little to no understanding of the journey that is laid before me. With the Iliad, I have seen many films and heard many stories about the Trojan War, so I had many pictures in my head as I started my journey. I felt I knew the purpose of the work and where it was going to take me, but I was completely wrong. I started reading a prose translation, and I was fairly disappointed by it. It wasn't until about book 6 (of 24) that I began reading a poetry translation which I found to be infinitely better. The structure of the lines was much easier to follow, but the Robert Fitzgerald translation seemed more true to me - very poetic and beautiful verse - the way that people died stuck out to me. It was always something like 'and then death shrouded their eyes' or something of that ilk. There was no confusion that war is an ugly thing - no overly dramatic indulgence in the beauty of death, but there was a gentle poetry about it that sticks out in my head. We all know about the story that detail the lives of the Archanians (Agamemnon, Menelaus, Odysseus, Ajax, etc) and their war with the Trojans (Hector, Paris, et all), and the beauty of Helen leading to the inciting event of the war. With all my prior knowledge from various non-direct accounts of 'The Iliad', I had a pre-conception of what the novel was supposed to be about. It was all SUPPOSED to be about the Trojan war, the struggle for power brought on by a king, the direct familial repercussions of men being lost in battle, the glory and fate of Achilles, the interaction between Gods and men, etc. I suppose it is all of that, but after reading the work I felt deeply that the purpose of the novel was to show the mental and emotional struggle of Achilles. Let me lay the foundation of why I believe this to be the case. First off, there is NO TROJAN HORSE in the book. Seriously. I was completely shocked by this. I thought right up until the last sentence that I was going to see something like "And then they made this horse, hid in it, and then Trojans took the horse into the city it was ransacked and everyone died and so did Achilleus (in the ankle, btw), and so it goes." Not so. There was no horse and no death of Achilleus. I found out that this was written later as a book between 'The Iliad' and 'The Odyssey' called 'The Aenid' by Virgil. I guess now, I have to read that. So - if there is no horse and there is no death of Achilleus, what is the novel about? Well, you may think that it was a love story because of the whole thing with Helen, but that was so lightly touched upon - like a footnote - that it hardly had any bearing on anything at all. Plus, women seemed to be treated as mere possessions in this work, and not as love interests. Even the Achilleus / Breisis connection was overblown. Achilleus even states that she was his prize slave, not anything more. So if it's not about the invasion of Troy or the mortality of Achilleus or love, what's it really about? I feel very strongly that it's about the difficulty that Achilleus had with life. He was born of a mortal man and a goddess, symbolizing to me that he didn't really belong to either class. He had tremendous gifts for fighting and war, and only participated in it because there was nothing else for him to do in life. He didn't want to become a nobleman (he despised nearly all of them, save for maybe Odysseus) and he didn't want to fight. When Patrokles died, he felt he no longer had anything to live for. The one person he loved more than any other was dead, and he cared so little for himself and the world around him, death (and honour) was the only thing he had left to live for. He cared little for death because he knew it would free him. There was so much dedicated to the mourning of Achilleus, it overshaddowed everything else in the novel. He would not eat until preparations were made for Patrokles body (which required the armor worn by Patrokles to be re-captured from Hector's dead body), he would not resume war until funeral rights were over (both for Patrokles and Hector) and even the return of BresisPatrokles). I'm interested to know what you in the blogosphere think of this theory on the purpose of the book. To round on this review, the mutations of the story that you have heard through movies and other forms of literature make reading this work imperative to your understanding. The book was a daunting read at times, but the poetry translation was beautiful and I strongly recommend the Robert Fitzgerald translation (I have heard the Robert Graves translation is very good as well). There is definitely one book (Five, I think) that is just an endless roll call of names and histories of people participating in the war. Many think this was added in later and was not the work of Homer at all, though Homer may have never existed anyway... there is very little known about him and I think many assumptions have been made and information misused in 3000 years. I also want to touch briefly on the Gods. From a purely editorial perspective, some books use Roman versions of names (including those of men - of which Ajax is a good example) and some use the Greek versions of names and some get confused and use both. I would recommend sticking to the Greek, because this is a Greek work... but that seems to be an individual consideration. The more important point of the Gods is the fact that they are shown to be meddlesome, and flawed. I wasn't expecting them to be so flawed - they were treated as if they were humans that just couldn't die and had extraordinary powers. They had emotions which drove how they reacted to situations, and I wasn't expecting this. I also learned quite a bit about the history of the Greek Gods, and I think I would really enjoy reading something else that explained more about Cronos and his sons, and how the world was split into three parts - the earth/sky, the oceans and the underworld. There was a little bit of trash talking between Zeus and Poseidon, which I enjoyed... and there was also a bit of the bitter man and out of line wife (Zeus and Hera) which I found interesting. Anyway, I'm completely rambling and this review is more of a hodge podge of my ideas, but I hope you found something in it that will either motivate you to pick up this novel eventually and cause you to question the purpose of the work to determine if you agree that it's about the trials of Achilleus. Above everything else, this is why I feel the work is considered a classic; it shows that humans are still undergoing the same trials and tribulations (this is life, no?) three thousand years later. I actually really liked the Fagles translation of this. It might have helped that I had a beautiful edition. I was also surprised at the lack of the Trojan horse! And that the gods were so petty and useless. It's been a couple of years since I've read it, but I'm sure you must be right about the center of the story being the struggle of Achilles. I think the first line says something about telling the "rage of Achilles." 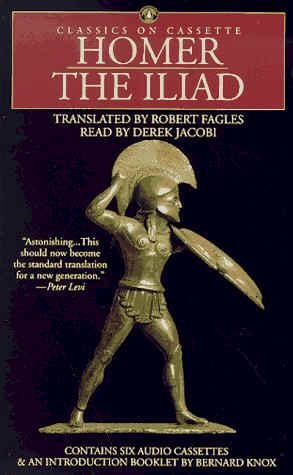 I LOVED The Iliad when I read it a few years ago. I really need to revisit it. Or at least get to the Aeneid, which I STILL haven't attempted. hurling down to the House of Death so many sturdy souls,"
This is what I love about Homer's The Iliad, and I now realize that a lifetime of study remains for me to delve into its pathos, drama, and experience the richness of emotion that comes from every line. It just may be the most important literary work that humankind has been gifted with.